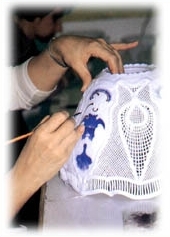 Romania is well known throughout the world as a country with a heritage and tradition in porcelain manufacturing. The nest and cradle of Romanian porcelain is in Transylvania, due to its belonging to the old European empires of the past. Overtaking the heritages and traditions passed over by Alfold Hungary and Rosenthal Germany in the old citadel of Klausenburg (Cluj), Porcelain Manufacturers Moga is the first private porcelain Manufacturer in Romania. 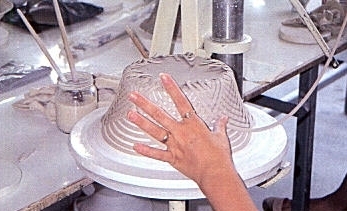 Because the times did not allow private manufacturing, the first private ownership of porcelain manufacturing in Romania has been in existence only since June 1990 due to the efforts, diligence and passion of the Moga family. Giving value to the heritage and tradition that existed in Cluj-Napoca through generations, Porcelain Manufacturers Moga is well known today throughout the world from Japan to the USA. 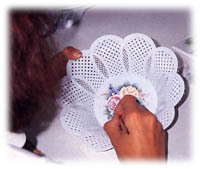 Having started with woven lace porcelain baskets; for which the company is well known in the largest cities of the world, Vienna, Paris, Frankfurt, Dresden, New York, and Tokyo; Moga has expanded it’s products to include fine porcelain lace figurines, lamps, dinnerware and home décor. Care is taken with every detail. 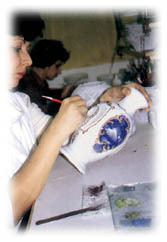 The artists and craftsmen of the company are adding value and noblesse to the “white gold” as the porcelain is known throughout the history of human kind, creating real unique works of art. It is said that Moga porcelain is as delicate as Limoges, more sophisticated than Beleek, as beloved as Meissen, and as requested as Herend.